Thanks to the hard work of a dedicated team of volunteers, the Epping to Ongar branch line railway in Essex is set to reopen to passengers next month. From Friday 25th May, the Epping Ongar Railway will be operating a steam and diesel service between Ongar and North Weald, with a diesel shuttle taking passengers onward into Epping Forest. 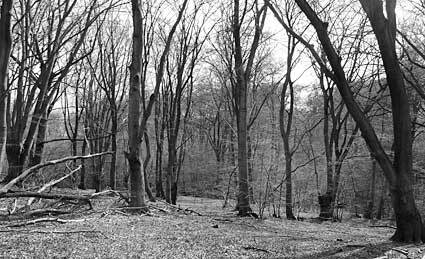 I can remember travelling on this 6.5 mile branch line when it was still part of the London Underground network, and it made for a unique tube journey. Back then, it was possible to get on the Central Line at Oxford Circus, and then change at Epping (above) before rattling through open fields in a tube train towards the terminus at rural Ongar. 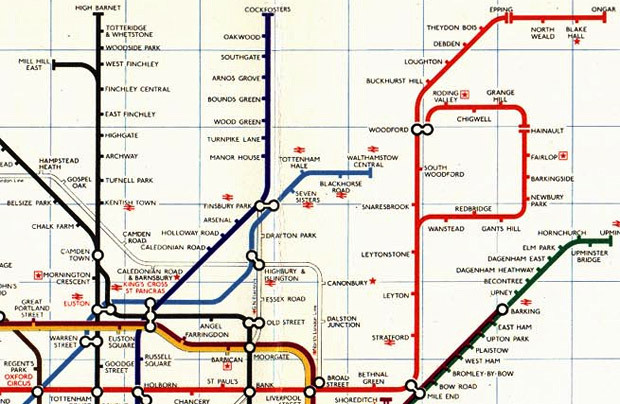 This 1977 tube map shows the location of the Epping to Ongar branch, with the line occupying the top right corner. 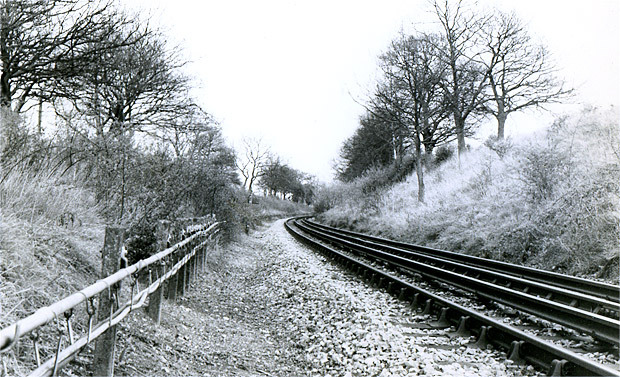 Running deep through the Essex countryside, the Ongar branch was single track with North Weald (above) offering the only passing place for trains travelling in opposite directions. 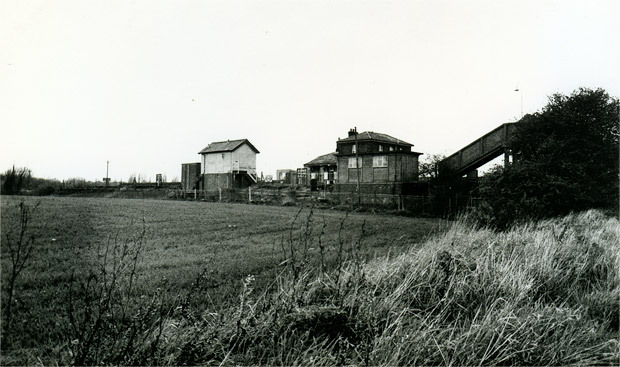 The station originally acted as a goods terminal for nearby farms, but later proved useful to airmen travelling to and from the nearby North Weald Airfield during World War II. 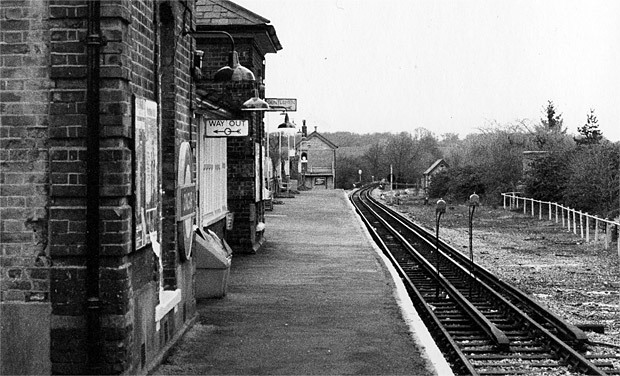 The station’s two platforms were used from 1949 until 1976 when the westbound track was lifted, although the boarded-up signal box can still be seen in this early 1980s view. There’s still not a lot to see around North Weald, but there’s a lovely pub a short walk away, the King’s Head. 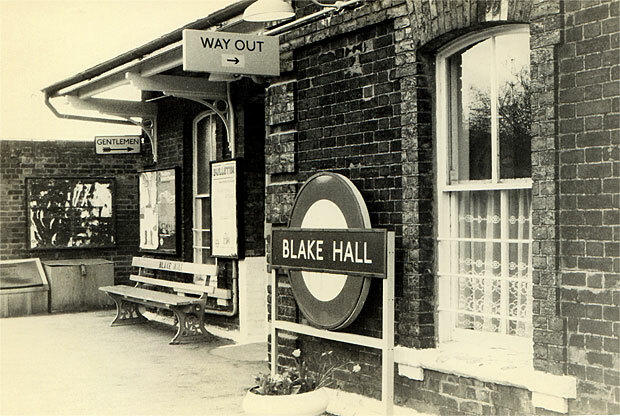 My favourite station was the evocatively named Blake Hall, located miles from anywhere. 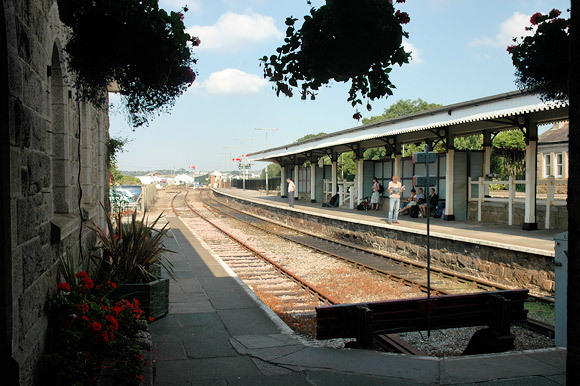 Taking its name from a country house a mile or so away in the village of Bobbingworth, the station was built as a condition of the railway being allowed to cross the land, and remains a considerable distance from any substantial settlement. 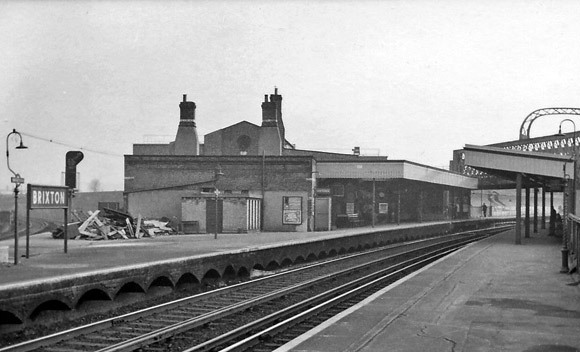 After its modest goods yard closed on 18 April 1966, the station became infamous as the least used on the entire Underground, and at the time of closure on 31 October 1981, passenger numbers were said to be as low as just six passengers a day. 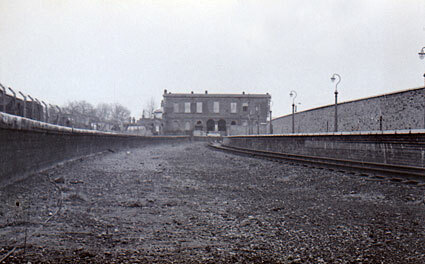 The station building still exists but has since been converted into a private home, while the passenger platform has been demolished. It’s likely that this station will never see passengers again, but it was a privilege for me to have been one of them, and to have had the chance to chat to the station master (who must have had the easiest job on the underground!). A view of the line between Blake Hall and Ongar showing the rural nature of the route. 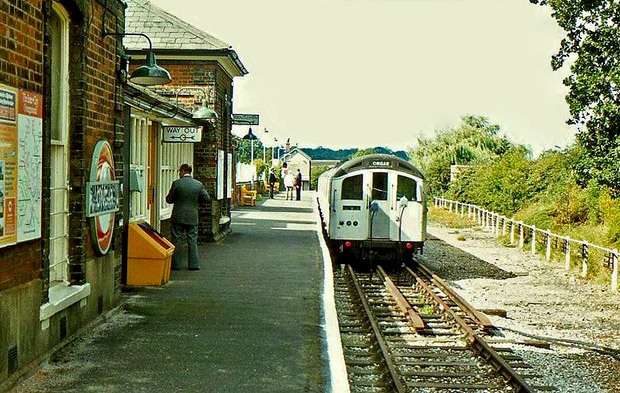 End of the line at Ongar, showing the buffer stops at the end of the single platform. 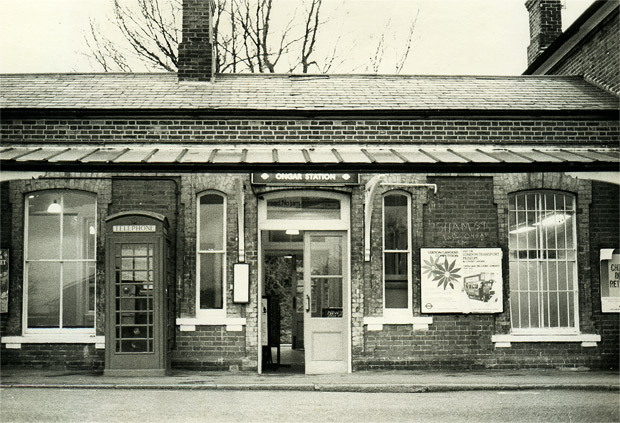 The station was opened by the Eastern Counties Railway on 24 April 1865, with London Underground taking over services from British Railways in September 1949. 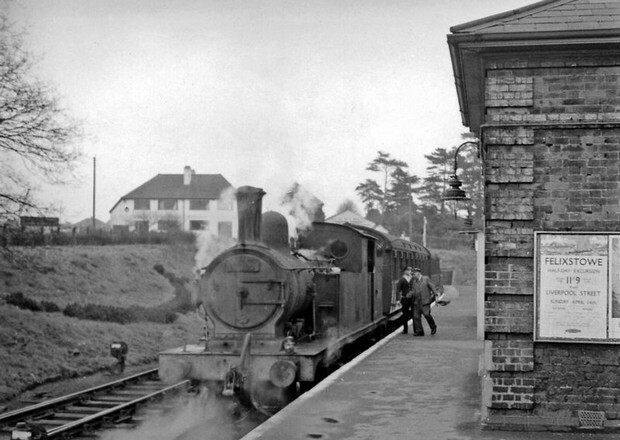 Trains were hauled by steam locomotives along the branch until the line onwards from Epping was electrified in November 1957. The photo above was taken just before the branch from Epping was electrified and shows ex-GE F5 2-4-2T locomotive No. 67200 preparing for the return journey [Pic: Ben Brooksbank, 9 March 1957]. After electrification, the power supply was pretty feeble, so the branch was only able to support two short (4 car) trains at once, making it unsuitable for heavy use (if there had been any such demand). 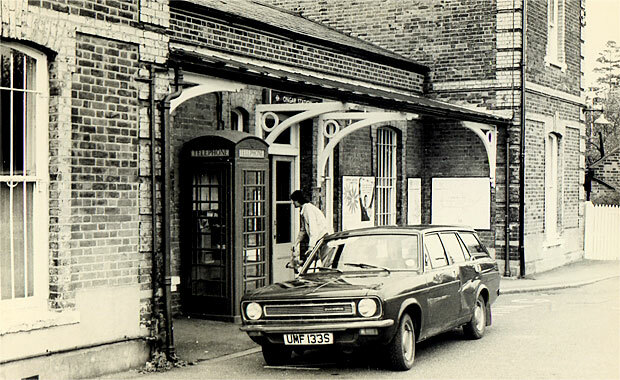 Towards the end, the Epping-Ongar service only operated during Monday to Friday peak hours, although there was a brief re-introduction of all-day services in 1990. 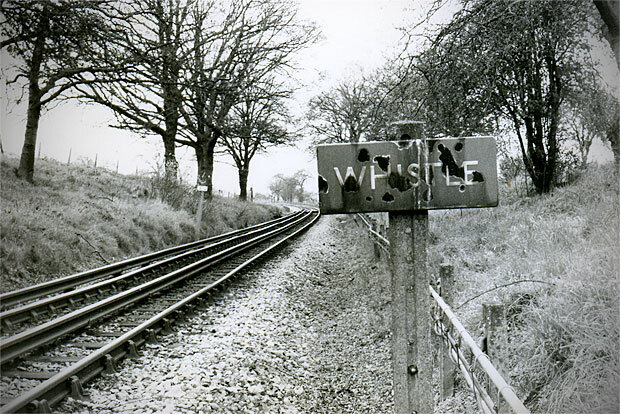 When the inevitable complete closure came on 30 September 1994, the line had reportedly failed to ever turn a profit. On the single platform, looking east to Epping. 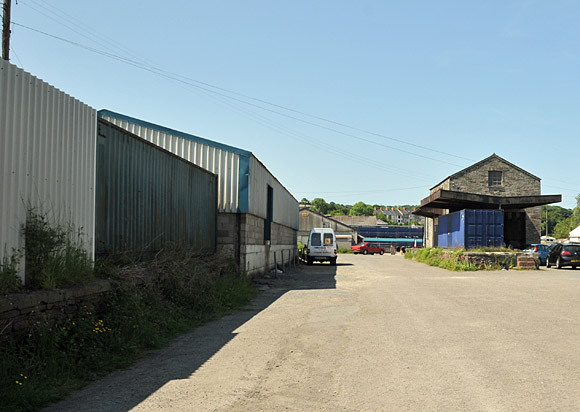 You can see the disused signal box in the distance – this was used to control station movements and the goods yard to the left. 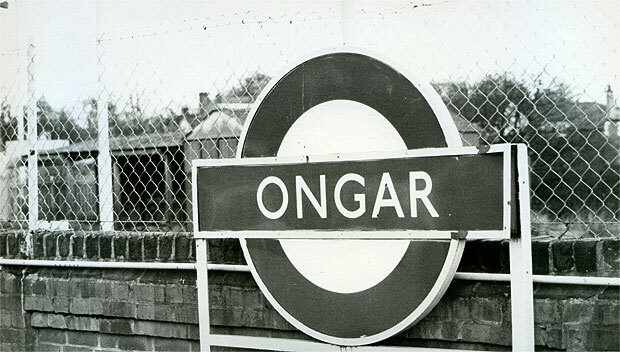 A curious fact about the station is that all distances on the London Underground network are still measured from Ongar, even though the station is no longer owned by London Underground [source]. 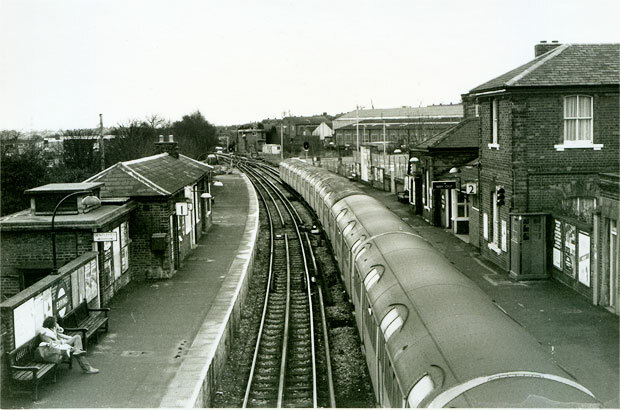 Similar view to above from Friday, 12 September, 1980 showing a train awaiting departure for Epping [pic: wikipedia]. 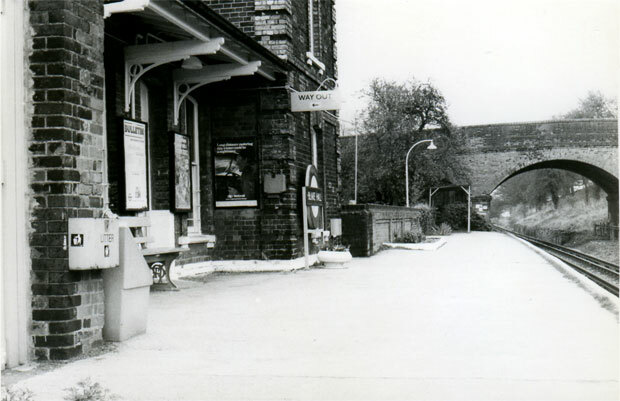 The ticket office at Ongar station was to the right of the door, with the platform straight ahead. 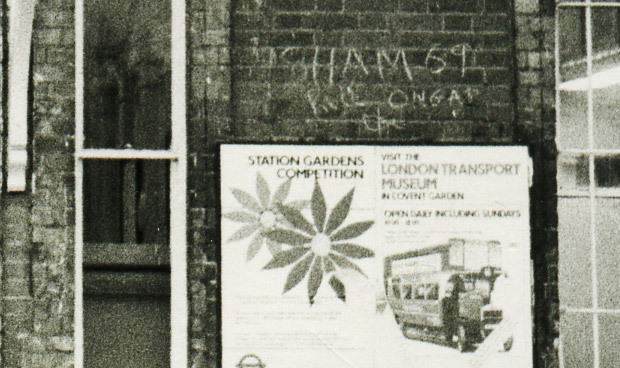 The chalked on graffiti on the wall says, “Sham 69 Rule Ongar” with what looks like an anarchy symbol below. Bless. 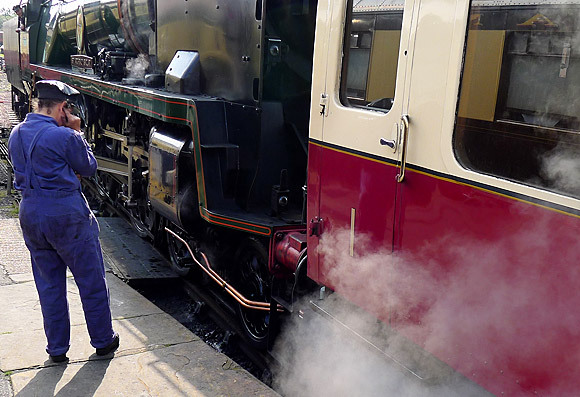 In the 150th year since the Great Eastern Railway was formed the Epping Ongar Railway, the longest heritage railway in Essex, will be resuming steam and heritage diesel hauled passenger trains on the branch. As the volunteers work towards concluding the restoration on the buildings, track, signals and rolling stock on the former end of the Central Line, the railway will be running services commencing a special weekend from Friday 25th May. Regular services will be running every weekend and Bank Holidays (including the Jubilee bank holidays) until the summer, then daily during the Olympics at nearby Stratford. On each operating day, the railway intends to operate steam hauled passenger services between Ongar and North Weald, a diesel shuttle from North Weald into Epping Forest, and a heritage bus service connecting to Epping LUL Station and High Street. I’m looking forward to visiting the restored line over the summer. Expect a photo update soon! Is this purely going to be a tourist attraction, or will there be any attempt to introduce ‘serious’ services for commuters? so far it appears to be a rich man’s toy train set. 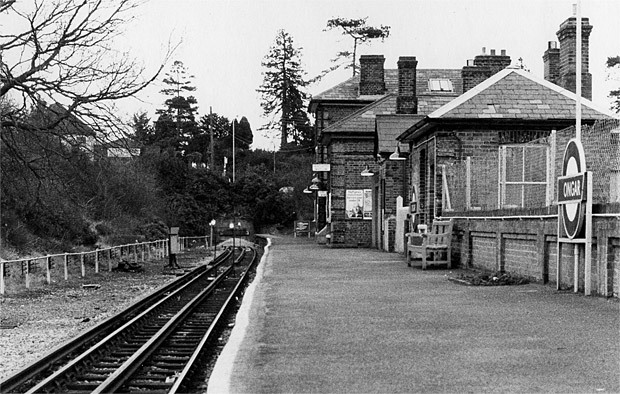 I lived in Buckhurst Hill, as kids we often took a rover and rode up to Ongar, Blake Hall being my favorite stop….sad but inevitable to close it. One of my close schoolfriends was one of those last six passengers at Blake Hall. 🙂 He caught the tube to and from school in Loughton every day. His parents had moved out from Ongar to Greensted Green a couple of years earlier, thinking he’d still be able to easily get to school. However LT ended up closing the station on his 17th birthday so for the rest of his sixth form his parents had to run him back to Ongar instead, where several of my other schoolfriends already got the tube.